On Christmas day in the year of our Lord 800, Pope Leo III crowned Charlemagne and revived the ancient empire, now reborn under the aegis of the church, after a 324-year hiatus due to the “barbarian” invasions. 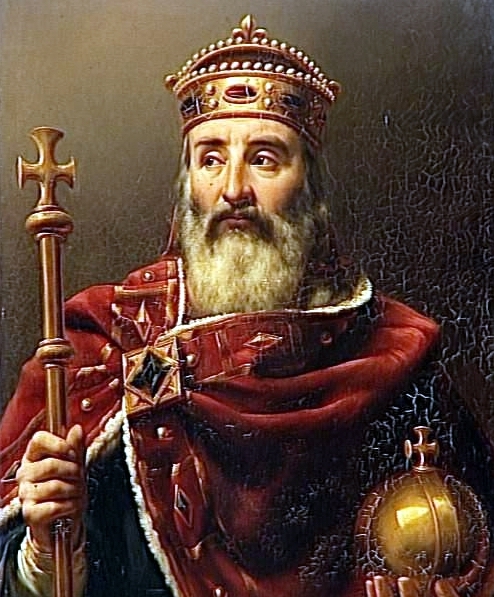 Prior to his coronation by Pope Leo, Charlemagne, formerly known plainly as Charles, was only king of France. Thereafter, almost the entire Western Christendom, with the exception of the British Isles and a small part of Spain, was under the emperor’s rule. Charlemagne tried to extend his rule to Spain expecting the aid of some Muslim leaders, which did not materialize. His rear was ambushed on his way back—an event that gave rise to the Chanson du Roland and other like it. As emperor, Charlemagne did not observe a separation of Church and State in that he appointed bishops just as he appointed civil servants, although always seeking men of worth. He likewise enacted laws relating to worship and other religious observances, including the collection of tithes as if the same were taxes. Charlemagne was a fan of learning. Albeit not being educated himself, he advocated the establishment of schools and the revival of those already existing. From Spain, he brought Theodulf and appointed him bishop of Orleans. Theodulf then ordered that throughout his diocese, there should be a school in every church open to all. Other bishops soon followed such a policy and this greatly aided in the revival of learning as an enterprise. This openness to learning, manuscripts were copied and theological activity flourished. The great systematic thinker of that time was John Scotus Erigena, a native of Ireland who had fallen heir to the knowledge of antiquity that had been preserved in the Irish monasteries. He was well versed in Greek. His most famous work was On the Division of Nature. A significant controversy of that time was that with the “Mozarabs.” These Christians kept their ancient pre-Islamic traditions, including their form of worship. The conflict arose, when the Mozarabic Elipandus declared that, according to his divinity, Jesus was the eternal Son of the Father, but that, according to his humanity, he was son only by adoption. This led many to call Elipandus and his followers “adoptionists,” although there was a vast difference with what Elipandus taught and that of adoptionism. The latter claims that Jesus was a mere man whom God had adopted. The crowning of Charlemagne put the papacy in an ambiguous position, on whether or not they are to meddle in secular civil affairs of the State. This period marked the decline of the papacy, as popes would succeed one after another in rapidity due to intrigues and even assassinations through poisoning. After the Carolingian Dynasty, numerous attempts at reform were instituted by some of the monastics and popes such as the monks of Cluny, Bernard of Clairvaux, Bruno (Leo IX), Hildebrand (Gregory VII), Urban II, Paschal II, Gelasius II, and Calixtus II.